The chain of Metro Bicycles shops that put up this sign also runs the store on 15th and 6th ave.
Click here for ad from the 1980-81 issue of the Manhattan Telephone Directory for these and 4 other stores in the chain. In July 2004 Robert Denison, Pres., Denco Distributors/Metro Bicycles wrote to explain that the bicycle here "was painted in 1970 from a design by Ernest Dieringer. The original sign included a chain and lock that wrapped around the vent pipe and appeared to secure the bicycle to the pipe. Life magazine printed a photo of the wall in the Oct. 6,1972 issue and it was used on the cover of Parsons catalogue in 1974." Bob also gave some background on Metro Bicycles. "We opened on 14th and First in late 1969. This was about a year after John Lindsay named Thomas Hoving (Tiffany heir) to be his parks commissioner and Hoving started closing the roads in Central Park on week-ends. Almost immedately about ten little bicycle rental stores sprang up around the park, and adult New Yorkers started riding for week-end recreation. This was the start of a national trend that was called the "bike boom" in the industry. Before 1970 most of the bicycles sold in the US were for children, with a few excentric professors riding in college towns. After 1970 bicycling became an adult activity in the USA. 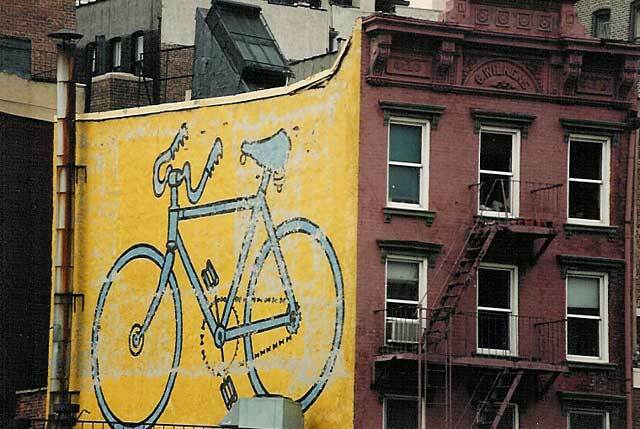 Many of the bicycle rental stores in NY began selling new bicycles, parts, repairs &c.. I bought out a partner in 1972 and with my brother as a new partner opened stores around Manhattan (two in Queens)." In 1984 this branch of Metro Bicycles moved to 332 E. 14th St. - i.e., on the other side of 14th St. and up the block towards 2nd Ave. The sign was painted over some time after 1986. In 1993 this ad in the New York Times showed 7 Metro Bicycles locations, including 14th St. between 1st and 2nd Aves. and 6th Ave. corner of 15th St.
G. Wilkens was Gustav Wilkens (1848?-1914? ), an immigrant from Germany, who bought the building in 1888 and had it re-built to serve as a jewelery store with living space on the 3 stories above. New York City Dept. of Buildings documents mention a "New Gal [galvanized?] Iron cornice bills[?] & lintels to be put up." Wilkens was a watchmaker and jeweler in business on 1st Ave. from the early 1870s. He was 31 in the 1880 U S Census living at 226 1st Ave., then 61 in the 1910 Census living at 241 1st Ave. with wife, Lena 57, and daughter, Amelia 30. After Wilkens' death around 1914, G. Wilkens was taken over by James Alfred Schmich (1890-?) and Frederick W. Krebs, who continued to run the business until the mid-1940s.